I have over one hundred and fifty books on my “to read list.” Most of them are big books; important books. Most of these books are theological in nature. They address the big questions in life. They stimulate my thinking. They warm my heart. These books lead me closer to the Savior. So why would I pick up a book about a burned out corporate executive who took a job on a “wing and a prayer” at Starbucks? Why would I pick up a book about a guy who lost everything and traded a life of affluence for a blue-collar job and a green apron? Perhaps the Starbucks label drew me in. Or maybe the tagline by Hartford Cournant worked its magic with the word, “inspiring.” Whatever it was, this little book edged out a bunch of good books and captured my attention for five or six hours. How Starbucks Saved My Life is the riches to rags tale of a high-paid advertising executive who was not only fired but also threw away his marriage and ended up jobless, without health insurance and faced an expensive surgery to remove a tumor in his brain. The book is readable from start to finish and is extremely difficult to put down. The author utilizes his writing experience to lure readers in – a story that is both compelling, inspirational, and heartbreaking. Another interesting feature of Gill’s book is the management philosophy of Starbucks. He characterizes the coffee giant as a business who cares for their employees; a business who takes care of their employees. Indeed, Starbucks is an organization that truly makes every guest feel special. 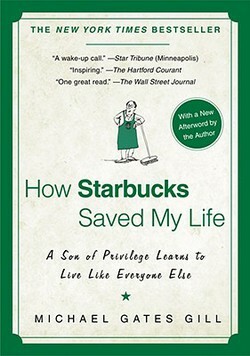 How Starbucks Saved My Life is a story about a man who comes full circle. Gill admits his failures. He owns up to his mistakes. And in the final analysis, he celebrates his victories. It is a story about the power of humans who connect with one another. So why would I pick up a book like this? Is it possible that every person wrestles with the same kinds of things that Michael Gates Gill struggles with? The deepest answer to this question for belongingness is found in the gospel of Jesus Christ – a point that is never addressed in the book. So the tension runs thick as the author beautifully expresses his need for belonging and connectedness.